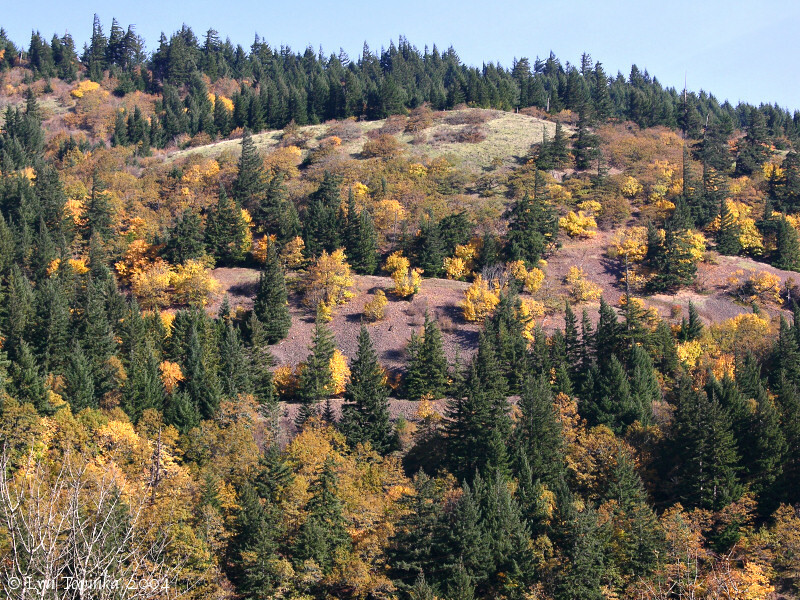 Dog Mountain contains the thickest (over 4,000 feet) section of Grande Ronde Basalt in western Washington. It lies on the Washington side of the Columbia River at River Mile (RM) 160, thirteen miles upstream of Stevenson, Washington. Just downstream from Dog Mountain is Wind River and Wind Mountain. Upstream lies Cook Hill and the Little White Salmon River. The Collins Point Landslide is between Wind Mountain and Dog Mountain, with Grant Lake nestled inbetween. 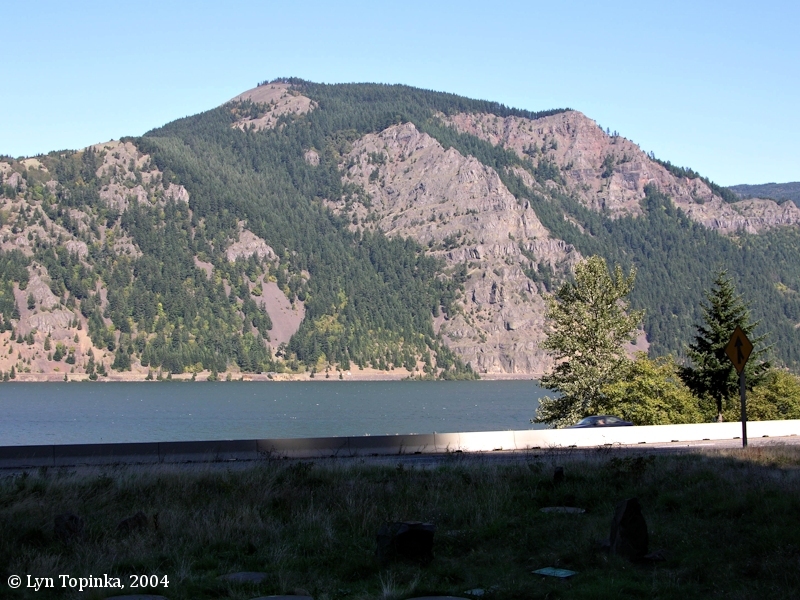 Oregon's Starvation Creek State Park is across the Columbia, and a good view of Dog Mountain can be had from the parking lot. Use Washington State Highway 14 to reach Dog Mountain. Hikers can take a steep day hike with views of Mount Adams, Mount Hood, and Mount St. Helens. Dog Mountain elevation rises from 60 to 2,860 feet. A lookout on Dog Mountain existed between 1931 and 1967, at the 2,480-foot elevation. Two buildings occupied the spot, one between 1931 to 1953, and the second between 1953 and 1967. 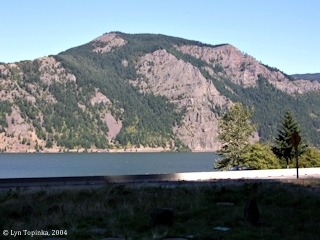 According to "Firelookout.com" Website (2006) in later years it was staffed by personel from the Mount Hood National Forest for its excellent viewpoint across the Columbia River. Click image to enlarge West side of Dog Mountain, Washington. View from Washington State Highway 14. Image taken November 4, 2004. On April 13, 1806, while Captain Lewis was on the Oregon side of the Columbia trying to purchase a canoe to replace one of their damaged canoes, Captain Clark proceeded up the Washington shore to the mouth of the Wind River, a river Lewis and Clark called "Cruzats River". Here he expected to find a party of hunters they had sent out two days earlier. Not finding them at Wind River, Clark and his men proceeded on upstream and set up camp at a spot at the base of Dog Mountain, between Collins Creek and Dog Creek, two creeks marked on the route map but not named [Moulton, vol.1, map#78]. Clark's campsite flag shows the camp to be very near the right bank (western) mouth of Dog Creek. Dog Creek is located on the Washington side of the Columbia at River Mile (RM) 161, just upstream of Collins Creek, and follows the east side of Dog Mountain. 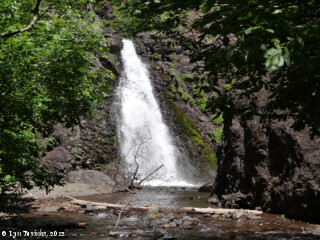 Dog Creek Falls is 30 feet high and 10 feet wide, and can be seen from Washington State Highway 14. Dog Creek Falls is one of many falls in the Columbia River Gorge. Click image to enlarge Dog Creek Falls, Washington. Dog Creek is on the east side of Dog Mountain. Image taken June 15. 2012. 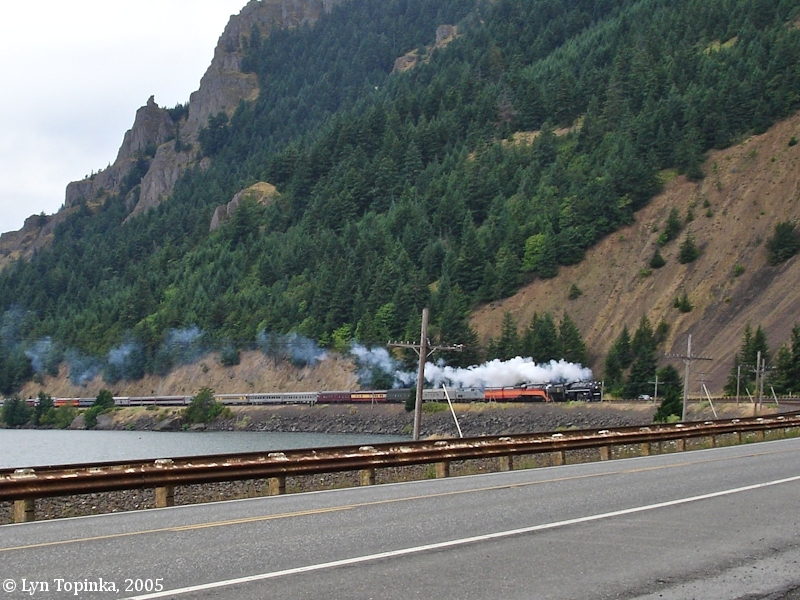 On July 6, 2005, two steam engines, the Spokane, Portland & Seattle's #700 and the Southern Pacific's #4449, pulled 17 vintage cars on an excursion up the Columbia River Gorge, from Portland, Oregon, to Wishram, Washington. Known as the "Western Star", the SP&S 700 pulled the outbound journey on the Washington side of the Columbia River, while the SP 4449 took the journey home. Since the journey operated as an Amtrak special, an Amtrak P42 was in the lineup as well. The excursion was chartered for the National Railway Historical Society's 2005 convention being held in Portland. A SPECTACULAR vantage point to view the event was from the pullout at Dog Creek, just east of Dog Mountain. 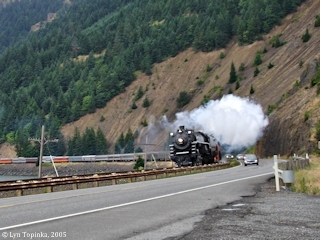 Click image to enlarge "Western Star" Excursion Train, rounding bend, Dog Mountain, Washington. Dog Mountain rises above a special excursion train, the "Western Star", July 6, 2005. View from Washington State Highway 14, at the Dog Creek Pullout. Image taken July 6, 2005. Click image to enlarge Penny Postcard: Shellrock Mountain, Oregon, and the Columbia River Highway, ca.1937, with Dog Mountain in the background. Penny Postcard, Postmarked 1937, "At the foot of Shell Rock Mountain, Columbia River Highway, Oregon.". Published by The Oregon News, Portland, Oregon. Card is postmarked August 1937. Card #54. In the private collection of Lyn Topinka.